Register for The 4th Annual Fox Hollow "Fox Trot" 5k today! Additional race information can be found at http://www.foxhollow5k.com. 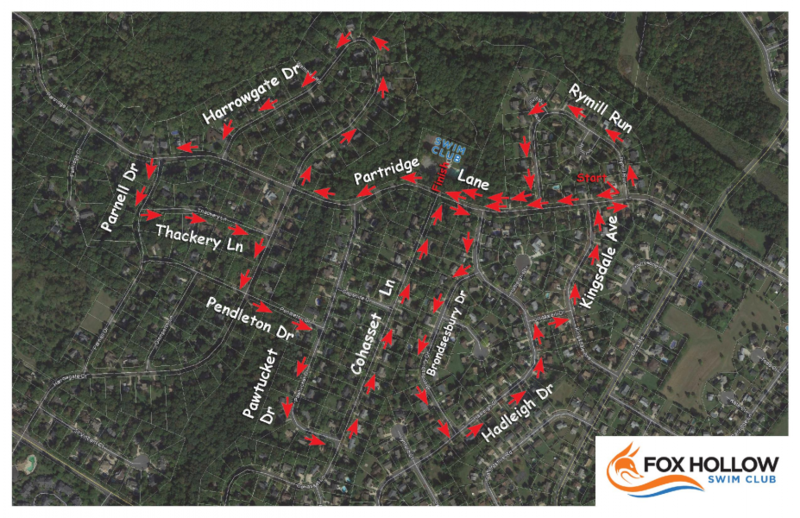 Description: The fourth annual “Fox Trot” 5k is a Run/Walk that will travel through the beautiful neighborhood of Fox Hollow in Cherry Hill on a USATF certified course. The race will start at 8:00 am. The starting line will be adjacent to 80 Partridge Lane, and will finish at the Fox Hollow Swim Club. Race shirts will be provided for all pre-registered participants and as supplies last on race day. Award Categories: Male and Female 1st, 2nd, 3rd overall will win medals and gift certificates. 1st, 2nd, and 3rd male and female in the following age groups: 8 and under, 9-10, 11-12, 13-14, 15-19, 20-29, 30-39, 40-49, 50-59, 60-69, and 70 and over will also win a medal. After the race: Join us after the race at the Fox Hollow Swim Club (51 Partridge Lane Cherry Hill, NJ) for an award ceremony and post-race festivities. Enjoy catered food, music, raffled door prizes, and medals for top finishers of the race as well as for each age group. Packet Pickup: Packets can be picked up on Friday September 14th from 12 noon until 7 pm at Fleet Feet in Marlton in the Marlton Crossing Shopping Center. Any packets not picked up can be picked up on race day at Beck Middle School beginning at 7 am. Transportation & Parking: For participants needing to drive to the race, we encourage you to park at Beck Middle School. A bus will be shuttling participants to the starting line, then back to Beck Middle School after the award ceremony in regular intervals. For those who live in the immediate vicinity, please carpool or walk to the starting line. No parking will be allowed on the course. Street parking near the start line for participants that have picked up their race packets will be available along Brick Road and East Partridge Lane and surrounding streets.